Performance Mini Tennis and GXLTC Academy is Directed by Andy Scholfield. Commitment and a positive attitude to enable good intensity are vital qualities for players to have. There are 20 players included in the Academy Programme, aged from 12 to 18 years. There are Mini Tennis Red Orange and Green Performance squads where Performance players where at least 30 children are involved. Aspirantes players are selected at Red level when aged 6 and 7 years. 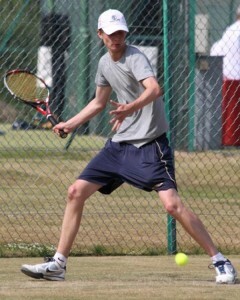 Performance Mini’s and Gxltc Academy players must compete in all Club competitions and matches. Players are expected to train at least twice per week in squads and have regular weekly individual coaching, do fitness training, and compete twice a month. Players are expected to follow the LTA Long Term Player Development Guidelines which enable players to reach their full potential. Players must compete regularly relative to age and experience (e.g. at least 40 competitive situations per year). If this commitment is not met players may be taken out of the Performance and Gxltc Academy Programme. Squad sessions are organised over two terms for the Winter Programme indoors at Bucks Indoor Tennis Centre plus outdoors under floodlights. Court time is available at Bucks indoor from Tuesday to Friday inclusive from 4.30 to 7.30 pm. During the Summer Term players train outdoors. Performance Mini Tennis squads for Red, Orange and Green gives a great pathway for players to progress into the Gxltc Academy.